← New eyes for SALT! I wrote previously about a paper on the detection of fullerenes in the planetary nebula Tc1… And I mentioned then that there was more than one group of researchers working on much the same thing. The other group have now published their paper, C60 in Reflection Nebulae, on arXiv. It’s currently in press, to be published in Astrophysical Journal letters. 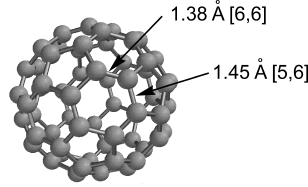 Suddenly, fullerenes are serious business. This entry was posted in Imported from Livejournal and tagged astrochemistry, molecules, papers. Bookmark the permalink.